In the surprise marketing deal of the century, Doritos and Mountain Dew have teamed up with Microsoft to promote the Xbox One. Like Doritos and Mountain Dew? 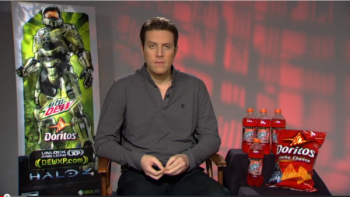 Geoff Keighley sure does, and he's a respectable journalist-type! Now you can turn your unhealthy addiction for equally unhealthy snack food into a profit, with the chance to win one of Microsoft's new Xbox One consoles! This fall, Dew and Doritos will offer thousands of Xbox One systems in what will be "the biggest gaming promotion in the brands' history." So how exactly can you turn munching chips and "doing the Dew" into an Xbox One? We're not quite sure yet. Distinctly lacking in the announcement of the promotion was an explanation of how it would actually work. We are told to register for updates on the promotion at www.DEWandDORITOS.com, and that the companies involved will be sharing more news throughout the summer. "The Mountain Dew and Doritos brands are going to reward gamers in the biggest way possible this year with a variety of opportunities to get their hands on the new Xbox One," said Larry "Major Nelson" Hryb. "We'll be sharing more details throughout the summer, but rest assured that DEW and Doritos are creating something that is truly befitting of our epic new generation hardware." Mountain Dew and Doritos are no strangers to teaming up with Xbox producer Microsoft, having teamed up in the past to promote the Halo franchise (when our friend Geoff first acquired his tasted for the delicious snacks). Mountain Dew even dipped its paws into Blizzard's coffers, appearing in a World of Warcraft cross-promotion some time ago. After Microsoft's embarrassing defeat by Sony at this year's E3, giving Xbox Ones away with packets of Doritos may be the only way they will be able to move the damn things.